Napa Valley Wildflower ~ The flowers of Napa Valley (not the grapes) create the tasty nectars that make this delicious Wildflower Honey. It is a light to middle-range amber wildflower honey that changes with the seasons. Each vintage from the special terroir has flavor nuances that will delight your palette. Napa Valley Wildflower is wonderful to cook with, bake with or to eat right out of the jar. This honey comes from our apiaries at some of Napa Valley's finest wineries where our bees forage the nectars from the wildflowers & flowers in the organic gardens at these impressive estates: Cakebread Cellars, Coppola, Domaine Chandon, Honig, Rudd. We also have apiaries at the St. Helena campus of The Culinary Institute of America and at the renowned French Laundry's organic garden. 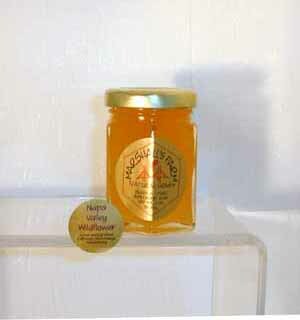 Wildflower Honey, Raw, Uncooked, Unfiltered, Unheated, Pure, Natural, Kosher.